Way older than rusty stuff are all the ancient ruins found in this part of the country. One of the best preserved ruins I saw outside of Mesa Verde was the Escalante Pueblo just outside Delores, CO. It's located a short walk uphill from the Anasazi Heritage Center. The Center is a museum that contains pottery and other artifacts that were rescued before McPhee Reservoir was filled and would have buried them. Lowry Pueblo is another pueblo I visited in the area. It's located in Canyons of the Ancients National Monument. It was built in the 1100s AD, as was Escalante Pueblo. Part of it is covered to preserve it better. The main complex contains 40 rooms and 8 kivas. Nearby is their Great Kiva. It is thought that the stone features on the floor are summer people and winter people. Also in Canyons of the Ancients NM is Painted Hand Pueblo. Built in the 1200s, it originally had 20 rooms, but has not been excavated, so all you can see is this tower. You have to look underneath to see how it got its name. I didn't really want to get that close, so this is majorly zoomed. One last hunt for ruins was up Sand Canyon trail a bit. We found this horseshoe shaped ruin. We had seen them before and they always face east. Our goal was Saddlehorn Pueblo. I don't know about you, but I'm just about "ruined out..."
But wait - right at the entrance to the trail head was this great piece of rusty stuff - it really saved the day! The Wetherill Mesa section of Mesa Verde National Park is usually open only from Memorial Day (late May) to Labor Day (early Sept), except for 2 days in September. We hit one of those days. The largest cliff dwelling there is Long House. In the summer a tram runs arond the mesa, but on these 2 days in September, you have to hike or bike. But it’s only 1 mile to Long House. With 150 rooms, 21 kivas, and a large plaza, it was quite a housing development in 1200 AD. There were no organized tours, but we were allowed to climb through most of the rooms. This is the view they had down canyon. We could even climb up the ladders. If I look like I’m gritting my teeth, it’s because the wood is really hot. After Long House, we walked the roads and trails to other ruins. They’ve had a lot of fires here over the years. We saw LOTS of horse poop all over the mesa. They have a lot of wild horses here, but they must have been hiding. These are the steps down to Step House. Well, not the prehistoric ones. 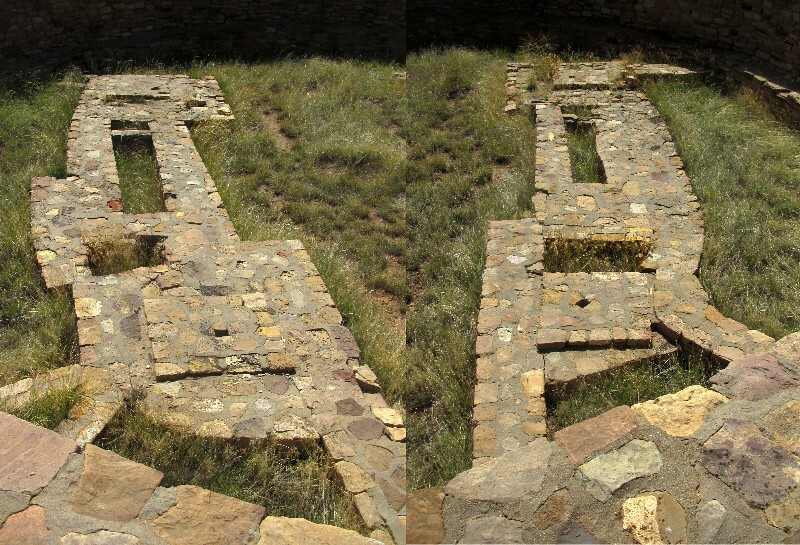 There was a reconstructed kiva there - kind of welcome after the buried ruins of Yellow Jacket. With a name like Snaggletooth Trail, we should have known. But the easy road in the beginning, and the beautiful scenery, drew us in. The Gambol Oaks above the canyon were gorgeous. The road follows the Delores River with red rock cliffs on both sides. But our fearless drivers pushed on, hypnotized by the beauty of it all. The trail climbs above the river at this point over some seriously rocky road. At times we had a choice of going over huge rocks or going off the cliff. If you’re wondering why I’m not out there helping rebuild the road, it’s because my door would no longer open. Now for the bad news - We had meant to go one way through the canyon and go home on paved roads. Unfortunately, after 5 miles of terrible rocks, we met some ATVers who said we wouldn’t be able to get through some narrow sections down the way. So we had to turn around and do it all again! Now for the better news - Phil is really good at auto body repair - this is not his first time - and already has most of the damage repaired. The Yellow Jacket Pueblo was the site of a large village from the mid-1000s to the late 1200s AD. This is what it looked like then. It covered 100 acres and 195 kivas, 19 towers, and up to 1200 rooms. Wow! I couldn't wait! Of which this is one. Let's just say you needed a good imagination. Apparently, they have dug these ruins up, and then reburied them to preserve them. I just didn't get it. This rock was kind of interesting. We did see a couple of petroglyphs. I think this is supposed to be a lizard. I thought the most interesting thing was the pottery shards. There were a fair number of them around. We are staying at the campground at McPhee Reservoir. The water is really low due to the drought. It's a beautiful campground, though, with short junipers and pinyon pines, so I can get my solar and satellite. Before we left Durango, we did another 4WD with Max. This time we drove to Ouray to begin. The aspens over Red Mountain Pass going into Ouray were out of this world. The cute little town of Ouray. This town also has a large hot springs pool. From there we started up to Imogene Pass. Once again there were lots of old mines and mills that look like they should be falling off the mountain. The Camp Bird Mine is down below, and is still active. And more wildlife, this time a cute little marmot. By the time we got close to the pass, the weather was deteriorating rapidly, and we were in the clouds. The top of the pass is on the left. It's the second highest drivable pass in Colorado, at 13,114 feet. Hmmmm.... I wonder who lives here? Looking down the other side. Alot of the road was switchbacks on narrow ledges. This wasn't the worst, but I was too busy holding on then. Another mine - I've given up remembering the names. Coming into Telluride, you go by Bridal Veil Falls, with the powerhouse on top. Another cute little town - Telluride - where we stopped and had a late lunch. Wow, another great trip! The Best 4WD Trip EVER!